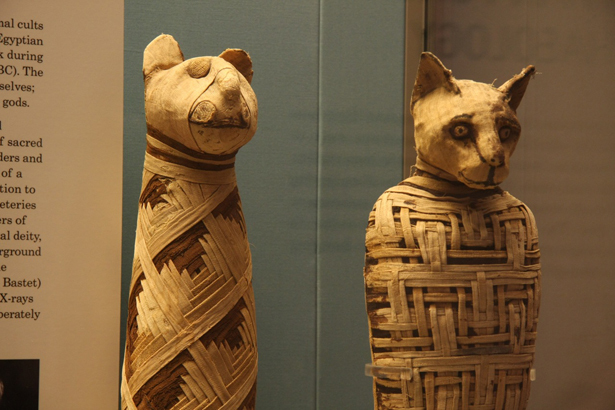 British Museum, mummies of animals (Egypt). The Home Workspace Program is pleased to present A Museum of Immortality, on view from June 11 through July 18, 2014 at Ashkal Alwan, Beirut. The exhibition is initiated by Anton Vidokle, following a curatorial concept by theorist and historian Boris Groys. A Museum of Immortality is comprised of works by more than fifty artists, writers, curators, filmmakers and architects who took part in and contributed to the 2013–14 Home Workspace Program, presented in an architectonic environment designed by Nikolaus Hirsch and Michel Müller. “In the 1880–1890s Russian philosopher Nikolai Fedorov developed the project of the ‘Common Task,’ which consisted of the creation of the technological, social, and political conditions under which it would be possible to resurrect all men who have ever lived—through technological, artificial means. Here, the Christian promise of immortality and resurrection had to be realized by technological means. Above all, however, Fedorov believed in the power of social organization, and in this sense he was a true socialist. True social justice meant for Fedorov also justice for the dead—the end of the privileging of the living in their relationship to the dead. This artificially produced immortality was for him a way to unite the right technology with the right social organization. After the October Revolution, Fedorov’s ideas became especially attractive, since materialist philosophy constituted the core on which Communist ideology was built. Balsam Abozor, Reem Akl, Liane Al Ghusain, Alina Amer, Barbara Anderlic, Stefan Bakmand Andersen, Christiane Assoury, Ida Kat Balslev & Nikola Hartl, Mirna Bamieh, Daniel Barroca, Monica Basbous, Mihaela Brebenel, Maeve Brennan, Tony Chakar, Miguel Fernández de Castro, Laure de Selys, Rachel Dedman, Goran Djordjevic, Paul-Flavien Enriquez-Sarano, Octavian Esanu, Fadi Hennawi, Hadia Gana, Raymond Gemayel, Romain Hamard, Maxime Hourani, Amal Issa, Rahel Kesselring, Jessika Khazrik, Jinjoo Kim, Tarek Knorn & Nada Zanhour, Lynn Kodeih, Ele Krekeler, Mikko Maki, Bettina Mooshamer, Mehreen Murtaza, Nanna Neudeck, Arjuna Neuman, Philip Pilekjær, Rivers Plasketes & Christopher Miller, Ambra Pittoni, Oleksiy Radynski, Raed Rafei, Eshan Rafi, Raqs Media Collective, Alicja Rogalska, Mahmoud Safadi, Maria Sarkis, Sarah Schalk, Clara Sfeir, Haruna Takakura, Pelin Tan, Graziella Rizkallah Toufic, Jalal Toufic, Anton Vidokle, Nathan Witt. The exhibition is presented as part of Chapter 5, the final chapter of the HWP 2013–14, led this year by Jalal Toufic and Anton Vidokle and open to all who wish to take part. For further information on the year’s program, click here. Chapter 5 will include two keynote lectures and a four-session seminar by Jalal Toufic, and workshops, screenings, and talks around the exhibition A Museum of Immortality, organized by Anton Vidokle. For each of the chapters in HWP 2013–14, Toufic has given a keynote lecture as well as a seminar in several sessions that explored a variation on “creating universes that don’t fall apart ‘two days’ later” that relates to the inclusion in these universes of what would ostensibly make such an endeavor even more difficult than it usually already is: mortals, labyrinths … The fifth chapter is concerned with creating universes that don’t fall apart “two days” later even when will and/or resurrection are introduced in them. Ruminations about the universe, cosmic space, and the radical evolution of post-human society in a planetary environment are traditionally conditioned by dispensing of the finiteness of human nature and the human mind. To ally oneself to the dimension of cosmology implies transcending the limits of human existence, and connecting with the realia that exceed what has so far been titled as human. To acquire higher intelligence or supreme ecological sensitivity, one has to attain the dimension of the alien, of the abstract machines of post-capitalism, of the accelerative streams of global potentialities of production, of the trans-historical cosmological matter. However, in works by Russian cosmists, or later in the theories of Russian avant-garde about new humanity, it was precisely the cosmological and the noospheric sublation of natural, social or civil conditions of human existence that was considered to be human per se. The question then would be the following: why was it that the notion of “human” had to be kept intact in the various futurological theories of historical socialism? Love Machines questions today’s shift to a post-humanist philosophy, with its dismissal of the notions of mercy, pity, and collective sensitivity as components of an outdated culture. Nikolai Fedorov’s early 20th-century Philosophy of the Common Task, which was fiercely anti-formalist (something still largely not understood) and aimed at annihilating the notion of death, deeply affected not just the political reality of the Russian 20th century, but its aesthetic drive as well. The lecture will be on the Arkady and Boris Strugatsky’s novel Monday Begins on Saturday (1964) and its interpretation in the First Bergen Assembly, curated by Ekaterina Degot and David Riff (2013). Humanity’s longest lasting remnants are found among the stars. Over the last fifty years, hundreds of satellites have been launched into geosynchronous orbits, forming a ring of machines 36,000 kilometers from Earth. Thousands of times further away than most other satellites, geostationary spacecraft remain locked as man-made moons in perpetual orbit long after their operational lifetimes. Geosynchronous spacecraft will be among civilization’s most enduring remnants, quietly circling Earth until the earth is no more. The Last Pictures marks a distant satellite with a record from the historical moment from whence it came. Artist Trevor Paglen collaborated with materials scientists at the Massachusetts Institute of Technology to develop a micro-etched disc with one hundred photographs, encased in a gold-plated shell, designed to withstand the rigors of space and to last for billions of years. Inspired by years of conversations and interviews with scientists, artists, anthropologists, and philosophers, the images chosen for The Last Picturestell an impressionistic story of uncertainty, paradox, and anxiety about the future. “A Lock for Every Key: The Excesses of Restraint” will investigate libidinal economies in politics and cultural life, with a particular focus on the consequences of the political uses of celibacy in India. Public: book launch of the second edition of Jalal Toufic’s Forthcoming, published by e-flux journal & Sternberg Press in April 2014. Joana Hadjithomas and Khalil Joreige explore their research focusing on artistic and cinematographic narration, the writing of history, the construction of imaginaries, as well as the notions of territory, cosmopolitanism and contemporaneity, specifically in their film The Lebanese Rocket Society: The Strange Tale of the Lebanese Space Race, and in their latest work around the virtual worlds of spams and scams.